An Inside View of Changing of the Guard - copyright G.K. Jakobs 2012. If you were to visit London (England!) today, you would see flocks of tourists congregating along Bird Cage Walk, faces pressed up against the wrought iron railings of the parade grounds of Wellington Barracks. They are there to catch a glimpse of the Changing of the Guard, a ceremonial procession during which a fresh squad of Guardsmen are march from Wellington Barracks to Buckingham Palace to relieve the Guards on duty there. There is a lot of pomp and ceremony involved. Much marching and stamping of feet. Yelling by Sergeant Majors. The band plays and the squad marchs out the gates. Tourists snap frantic photographs or try to capture the entire event on video. It is definitely a memorable moment. All eyes are fixed on the Guardsmen in their spiffy red uniforms and bearskin hats. Drawn from one of the Foot Guards regiments (Grenadier, Coldstream, Scots, Welsh or Irish), the Guardsmen are most impressive. Providing a backdrop to the Changing of the Guard is the white facade of Wellington Barracks. 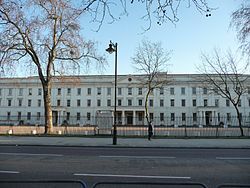 Completed in 1833, Wellington Barracks has housed a succession of Foot Guards, mainly those on ceremonial duties in London. 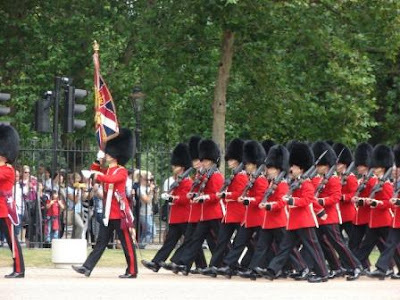 Today, the Barracks houses the Regimental Headquarters of the Foot Guards regiments, as well as the ceremonial battalion of Guardsmen. Few tourists could know that on Monday 28 July, 1941, the Wellington Barracks played a small role in the saga of German spy, Josef Jakobs. 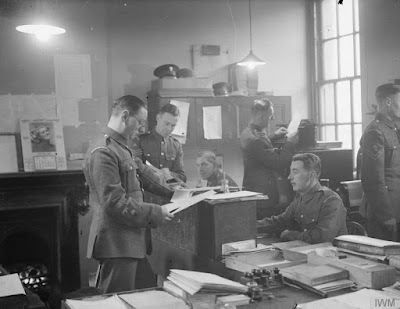 In order for Josef to be tried by military court-martial he required a "commanding officer" and that dubious honour fell to Lt. Col. George Mervyn Cornish, General Officer Commanding Holding Battalion Grenadier Guards. It was Cornish's duty to investigate the charge against Josef. Thus it was that on 28 July, 1941, Josef found himself being hustled into a back entrance of Wellington Barracks for his Summary of Evidence. Witnesses gave their statements, one after the other and Josef was given an opportunity to question them if he so desired. Aside from one question to the first witness, Charles Baldock, Josef asked no questions. The Summary of Evidence was taken down by Major Anthony A.H. Marlowe, the same man who would serve as Attorney for the Prosecution at Josef's court-martial. The following day, Lt. Col. Cornish approved the charge and Josef's court-martial was confirmed.